Small green crinkled edged leaves and clusters of white flowers . The Camphor Geranium has a great smell and looks great all year round. Perennial. H:80cm W:spread 80cm. 12cm, 17cm. 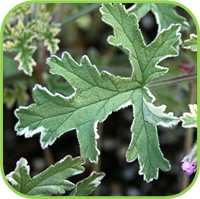 The Citronella Geranium is also known as the mosquito plant, when crushing the leaf you can rub it onto your skin and can be used as a repellant. The Geraniums is not grown for their flowers but for their scent, as they are fragrant all year long. This leaf is two toned, green with a white/cream margin and a red flower. The name says it all, the leaves has a strong peppermint scent and small white flowers with purple markings will appear in Spring and Summer. Perennial. H: 80cm W:spread 80cm. 12cm, 17cm. 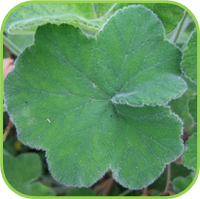 Geranium has a variety of uses, you can pick the leaves and flowers, dry it and use it as potpourii or place it in a sachet under your pillow. You can also add it to desserts, fruit drinks, punches and sauces. Scented Pelargoniums became popular when the French perfume industry realized their aromatic potential in 1847. 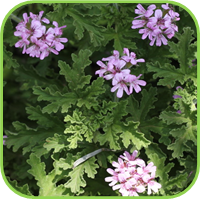 Most pelargoniums originate from the Cape region in South Africa. • Height: ±80cmm; Spread: ±80cm. • Plant it along walkways where it is easy to reach and brushed against to release the scent. • Use fresh flowers in salads and for garnishing. • Place leaves under baked apples or cakes to impart flavour. • Leaves may be infused to make tea, and used fresh to flavour desserts, punch, and vinegar. • Leaves give flavour to pâté, jellies, desserts, cakes, punches, and coffee. • Fresh leaves are used to flavour tea, desserts, jellies, and chocolate cakes. 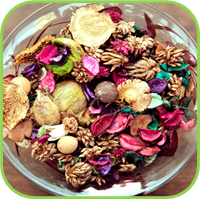 • Use in potpourris, herb pillows. 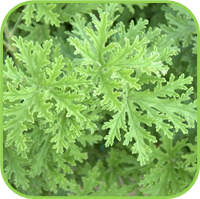 • Citronella geranium: Lemon-scented leaves. • Lady Plymouth: Minty, rose-lemon scent. • Nutmeg geranium: Aromatic, with a spicy, pine-like scent. 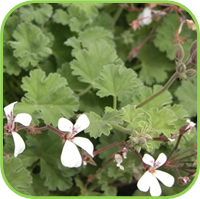 • Peppermint geranium: Strong peppermint scent. • Infuse leaves as a mild astringent to clean and help circulation of pale, sluggish complexions. • Add to bathtwater to sooth the skin. Nutmeg: Externally as a rub for aching feet or legs (fresh leaves).